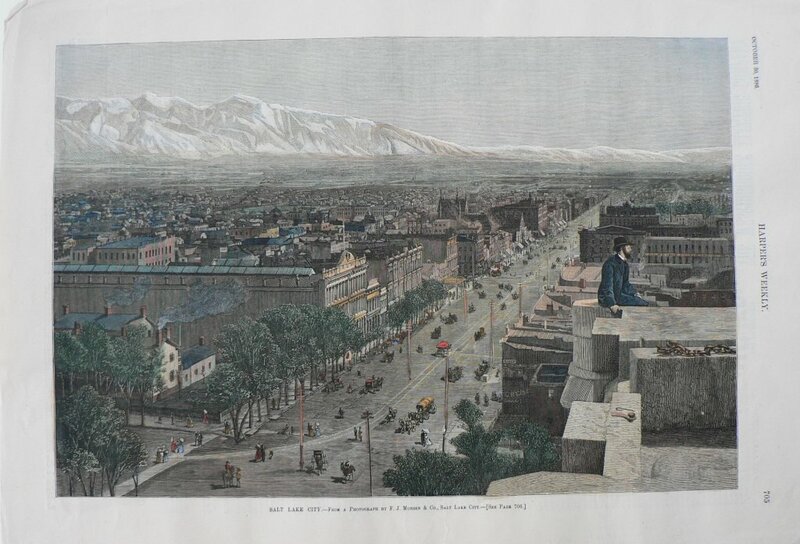 "Salt Lake City...From a Photograph by F.M. Monsen & Co."
Harper's Weekly, October 30, 1886. A very pretty and informative detailed elevated view of Salt Lake City as it appeared in 1886 nestled between the mountains surrounding the Great Salt Lake. The figure shown on the roof may be that of Brigham Young, the founder of the Mormon Church, The text on the verso of the wood engraving provides detailed information concerning the beginnings of the city and The Church of the Latterday Saints. 11 1/4 x 16 1/4 inches.